closes the opening to the larynx when food is being swallowed down the pharynx. Food is deflected away from the trachea to prevent particle aspiration (inhalation). Esophagus The esophagus is a muscular tube about 25 cm (10 inches) long (fig. 1-53). It is the passageway between the pharynx and the stomach. By means of peristalsis, food is pushed along this tube to the stomach. When peristalsis is reversed, vomiting occurs. Stomach The stomach acts as an initial storehouse for swallowed material and helps in the chemical breakdown of food substances. The stomach is a saccular enlargement of the gastrointestinal tube and lies in the left upper quadrant of the abdomen (fig. 1-53). It connects the lower end of the esophagus with the first portion of the small intestine (the duodenum). The stomach is divided into the cardiac, fundic, body, and pyloric regions (fig. 1-54). At each end of the stomach, muscular rings (or sphincters) form valves to close off the stomach. The sphincters prevent the stomach's contents from escaping in either direction while food substances are being mixed by peristaltic muscular contractions of the stomach wall. The sphincter at the esophageal end is the cardiac sphincter; at the duodenal end it is the pyloric sphincter. The chemical breakdown of food in the stomach is accomplished through the production of digestive juices (enzymes) by small (gastric) glands in the wall of the stomach. The principal digestive enzymes produced by the gastric glands are hydrochloric acid and pepsinogen. Hydrochloric acid activates pepsin from pepsinogen, kills bacteria that enter the stomach, inhibits the digestive action of amylase, and helps regulate the opening and closing of the pyloric sphincter. Pepsin is a protein-splitting enzyme capable of beginning the digestion of nearly all types of dietary protein. Most food absorption takes place in the small intestine. In general, food is not absorbed in the stomach. An exception is alcohol, which is absorbed directly through the stomach wall. It is for this reason that intoxication occurs quickly when alcohol is taken on an empty stomach. Abdominal Cavity The stomach and intestines are enclosed in the abdominal cavity, the space between the diaphragm and the pelvis. This cavity is lined with serous membrane called the peritoneum. The peritoneum covers the intestines and the organs and, by secreting a serous fluid, prevents friction between adjacent organs. The mesentery (double folds of peritoneum) extends from the cavity walls to the organs of the abdominal cavity, suspending them in position and carrying blood vessels to the organs. Small Intestine The small intestine is a muscular, convoluted, coiled tube, about 7 meters (23 feet) long and attached to the posterior abdominal wall by its mesentery (fig. 1-53). The small intestine is divided into three contiguous parts: the duodenum, jejunum, and ileum. It receives digestive juices from three accessory organs of digestion: the pancreas, liver, and gallbladder. 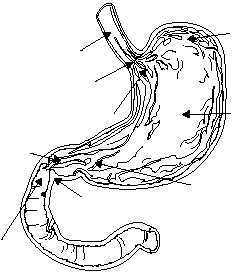 DUODENUM.The duodenum is approxi- mately 25 cm (10 inches) long and forms a C-shaped curve around the head of the pancreas, posterior to the liver. It is lined with a mucous membrane that contains small glands. These glands secrete intestinal juices containing the enzymes carbohydrase, peptidase, and lipase. JEJUNUM.The jejunum is the middle part of the small intestine and is approximately 2.5 meters (8.2 feet) long. Its enzymes continue the digestive process. 1-51 HM3F0154 FUNDIC REGION OF STOMACH BODY OF STOMACH ESOPHAGUS CARDIAC SPHINCTER CARDIAC REGION OF STOMACH PYLORIC SPHINCTER (PYLORUS) DUODENUM PYLORIC CANAL PYLORIC REGION OF STOMACH Figure 1-54.Major regions of the stomach.